The Buccaneer Boosters' BucFest Planning Committee met at the Oswego Sub Shop recently to finalize plans for their third annual pre-football game celebration. The BucFest Homecoming festival to be held next to OHS' Wilber Field on October 15th is open to the community and will feature games, delicious food and Buc spirit activities. Oswego Sub Shop has generously donated gift certificates for prizes. Pictured in the photograph are BucFest Planning members (back row) Lisa Giglio and Judy Queale-Dunsmoor and (front row) Kris Armstrong, Lu Collins and Chris Kearns. 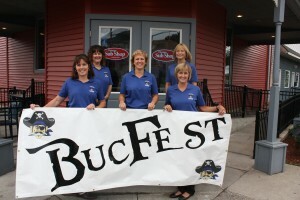 Oswego, NY – The Oswego Buccaneer Boosters have planned their biggest and most exciting â€œBucFestâ€ yet, to celebrate Homecoming 2010 and kick-off the Buccaneersâ€™ varsity home football game. â€œBucFestâ€ is planned for Friday, October 15, from 4-6:30 p.m., at the end of Joe Wilbur Field (rain location OHS gyms).Â The senior night ceremony for the varsity football and cheerleading teams will begin at 6:00 followed by the homecoming game against Jamesville Dewitt at 6:30. The cost of the 3rd annual event is $1.00 for students and $2.00 for adults, and most of the attractions are free.Â Every â€œBucFestâ€ visitor will receive a snack from Frito Lay, and blue and white â€œBuc Beadsâ€ as they enter. This year, four new and exciting attractions have been added to the festivities.Â G&G Reptiles (live) sponsored by Warner Physical Therapy, â€œThe Macho Bullâ€ mechanical bull, sponsored by Pathfinder Bank, Inflatable Bungee Race and The Fortress 50 foot inflatable obstacle course. The official â€œBucFest 2010â€ t-shirt, designed and donated in part by Visual Creations, will also be on sale during BucFest, with a limited number of shirts available. In true â€˜Bucâ€™ Spirit you will able to get your hair and nails colored in â€œBuc Blueâ€ as well as make a stop at the face painting/temporary tattoo booth. Digital Sound Entertainment, featuring â€œMarty the One Man Partyâ€ from 107.9 FM, will provide music for this yearâ€™s event. One of the most popular activities last year was the â€œdunk boothâ€ where students took turns attempting to soak their teachers or coaches. Attendees can choose to participate in a variety of games such as entering the radar gun sports contest, the football throw, decorating a pumpkin or â€œhippity hopâ€ races for adults and kids of all ages.Â Some games will offer prizes donated by Fajita Grill and Lighthouse Lanes. Children can get their photos taken with New York Boldâ€™s â€œChef Boldâ€, Frito Layâ€™s â€œCracker Jackâ€, or the â€œOswego Buccaneerâ€. This yearâ€™s menu includes BBQ chicken and pork, salt potatoes, blooming onions, cotton candy, snow cones, fried dough, candy and caramel apples, hot dogs and pizza, brought to you by Barlowâ€™s Concessions, Raging River BBQ, Gibby Thompsonâ€™s Irish Pub, Kings Concession, Camâ€™s Pizzeria and New York Bold. In addition to the festival, the Buccaneer Boosters are promoting a â€œBuccaneer Blue Weekâ€ throughout Oswego from, October 9th â€“ 16th.Â The Boosters will give a prize to the business owner and the homeowner who does the best job decorating for â€œBuccaneer Blue Weekâ€.Â Photos for consideration should be postmarked by October 22, 2010 and sent to attn: BucFest, P.O. Box 373, Oswego, New York 13126. BucFest committee member Lu Collins says, â€œWe also encourage the Oswego community to come out and watch the Homecoming Parade on Sunday, October 17 at 4:30 p.m. followed by the â€œO.H.S. Girlâ€™s Powder Puff Gameâ€. The complete homecoming week schedule can be found at www.oswego.org.